We woke up late this morning. Well, it’s not all that late since these days I am often still up at midnight, or 1 a.m., or 2 a.m. I’m actually more of a morning person, but we often can’t sleep. Sometimes I wonder if everyone has such a long recovery period? EJ worked with a young guy who had the same type of cancer JJ did. He asked him how he recovered from cancer, and he said, “I drank and took drugs.” So maybe everyone has a difficult time. I think that probably cancer journey’s can’t really be compared since people are different. However, I wouldn’t suggest alcohol and drugs. I made chili this morning and then realized that I didn’t have enough chili beans. So EJ and I walked to the post office this morning and then to our little store to buy some. After EJ left for work, I noticed that the cats were going after another mouse. I think it’s Mouse Number 9 since October 31st. This is more mice than we have ever had in a whole year. I wonder if that means that the winter is going to be especially harsh? When I was growing up, we often had snow in early November, but in recent decades it’s rare to have so much snow at this time of year. Usually we are lucky to get snow by Thanksgiving. I left the cats to their pursuit and I took Danny for his walk. As we left the house, I realized that in my distraction of watching the cats go after the mouse, I had put on my shoes instead of my boots so although I planned on going for a longer walk, we went on a shorter one instead. We have just enough snow now that it wasn’t comfortable walking in shoes. Cats vs Mouse. 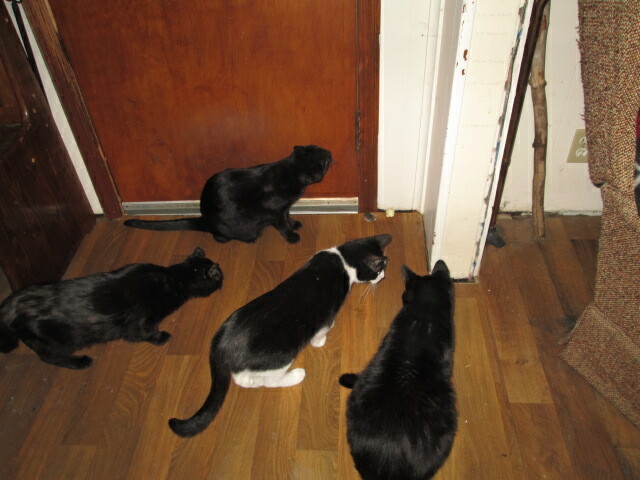 The mouse is near the right corner of the door. When we got home, I saw a cat playing with the mouse. He batted it under the woodpile next to the wood stove. I thought that I couldn’t leave the mouse to decompose there (yuck) so I moved wood out of the way until I reached the mouse. I was surprised when I saw that it was still alive. I wondered if it was the same mouse that the cats were pursuing last night, but I think that one was much larger. This one looked like a young mouse. I haven’t seen the body of the larger mouse, so it must have escaped. Or else its body is decomposing in some hidden place (yuck). The cats caught the little mouse and played with it. It ran, they pounced. It cried. Sigh. I wish the cats would kill their prey more quickly. I hate these cat and mouse games. I had enough so I tried to skootch the mouse into a bag to take him outside, but I couldn’t get it in the bag. I am NOT touching the thing. I left to do a few chores. When I returned, it looked like the mouse was dead, so I started to sweep it into the dustpan. It moved a bit and even got to its feet. I threw it outside. It will either make it or it won’t. Now the cats will have to find the mouse that got away. I restacked the wood, brought in more wood, and then put a light inside the outside cat house. The temp is supposed to be colder tonight and the light bulb generates heat for the cats. Then I refilled the bird feeders. We are, once again, enjoying the birds at the feeders. I took a video of birds eating from the feeders that I can see when I’m sitting in my favorite place on the couch. There is a pole with two feeders near the window and one with suet back near the fence. The birds love to sit on the wild rose-bush climbing the fence. Other bird feeders are placed so that EJ and JJ can see them from their windows as well. I love how the many birds swoop over our yard. Later, I made homemade bread because we are almost out. I make bread about twice a week. We have insulated curtains in the living room so we shut them every night to shut out the cold. This morning when I opened them, I surprised hundreds and hundreds of birds who took flight. It was awesome!